Be Wiser Ducati’s Scott Redding bounced back from a morning crash to lead the opening day of Bennetts British Superbike testing at Portimao. The former MotoGP man was spat off his Panigale V4R as he exited the hairpin before lunch but a new set of leathers and some repairs later, and he was able to push to the top of the timeheets with a 1’44.502 to lead Hona’s Xavi Fores by 0.026s. Redding, who had never ridden the track until today, was a second faster this afternoon than this morning while Fores didn’t improve on his 1’44.528. Former champion Josh Brookes, on the sister Be Wiser bike, put in a late push to bag third place on the timesheets with a 1’44.677 to trail Redding by 0.175s. 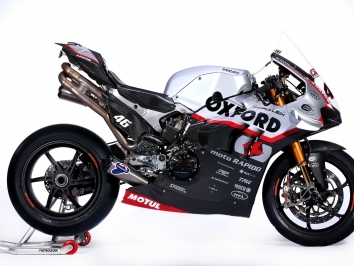 Oxford Ducati’s Tommy Bridewell made it three Panigales in the top four as he finished a little over half a second behind the Australian. Andrew Irwin found two-tenths over lunch to put his works Honda in fifth place, one ahead of Taz Mackenzie’s McAMS Yamaha. Claudio Corti took his WD-40 Kawasaki to seventh, just in front of Luke Mossey’s OMG Suzuki. Jason O’Halloran tucked the front of his McAMS-backed R1 but was unhurt and claimed ninth place with a 1’45.543 set this morning. FS-3 Kawasaki’s Danny Buchan completed the top ten with Josh Elliott, Glenn Irwin, Ben Currie, Matt Truelove and Ryan Vickers rounding out the top 15.